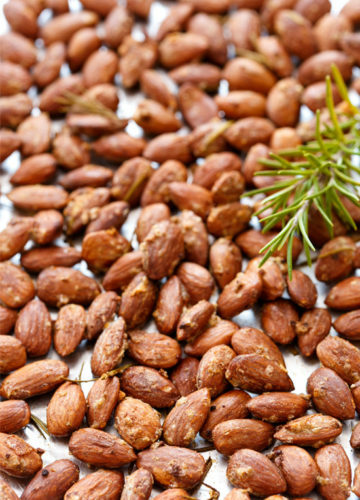 It’s no surprise that I love edible homemade gifts. 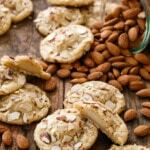 They are thoughtful, delicious, and they don’t contribute to the clutter that seems to endlessly plague our lives. If you know me, chances are you’ve gotten at least one jar of jam over the years. If you’re related to me, you’ve probably gotten a few more than that (let’s just say I make way more jam than I can eat). 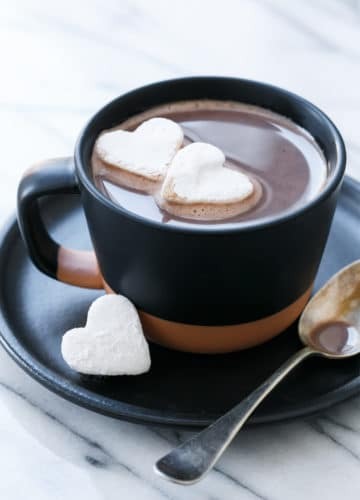 But lately, in an effort to expand my consumable gift repertoire, I’ve been exploring other gift-ready recipes that are equally unique and just as tasty. I don’t know about you, but I love to finish off my recipes with a pinch of “special” salt. I’m not talking about table salt or even plain old kosher. No, finishing salt is much more special than that. If you’re anything like me than you too have a salt library, dozens of jars and tins and sacks of every variety of salt imaginable, from smoked salt to pink salt to fleur de sel, volcanic black salt to truffle salt to sea salt with flakes so big they look like rock candy. I simply can’t resist a unique salt. 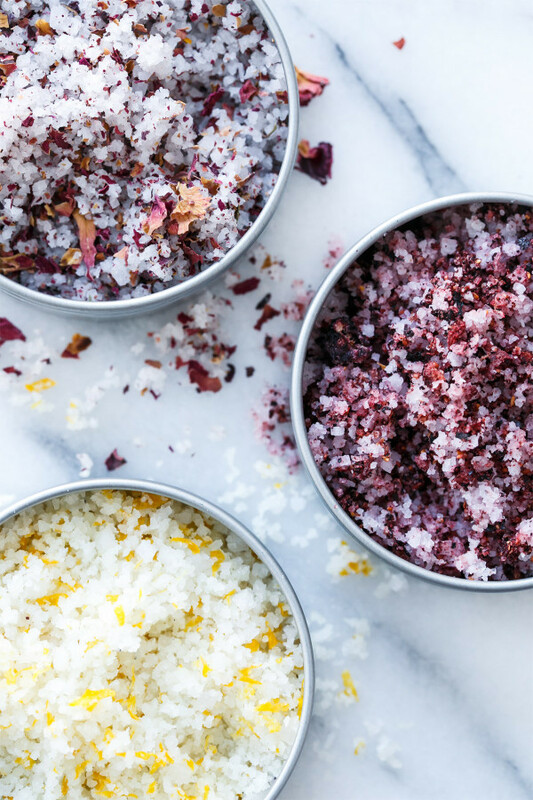 The beauty of these larger grained, specialty salts is that a pinch will go a long way. 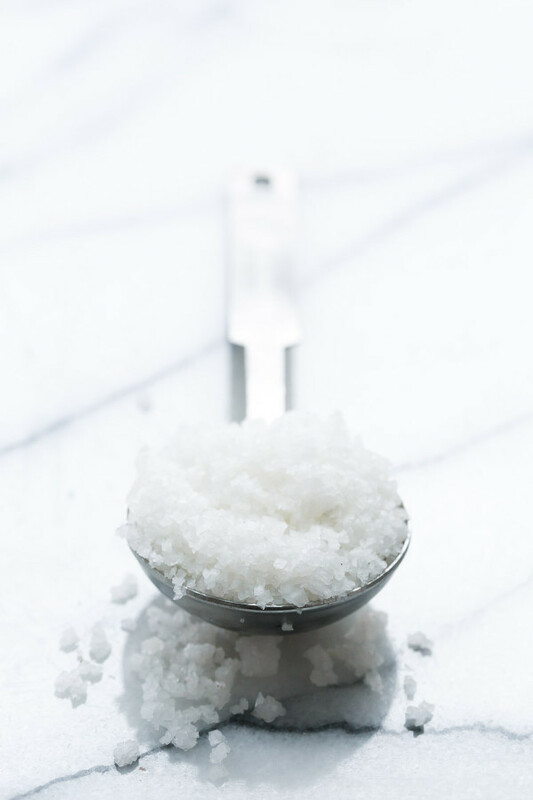 Since the salt is added at the very end, right before serving, the salt crystals aren’t absorbed into the dish, meaning you get much more taste and flavor with a fraction of the salt. Indeed, using a finishing salt can reduce the total salt needed in a dish dramatically. So even if you are watching your salt intake, a pinch of finishing salt on your home cooked meal is going to be far less sodium than a processed or restaurant meal that probably doesn’t taste nearly as good. 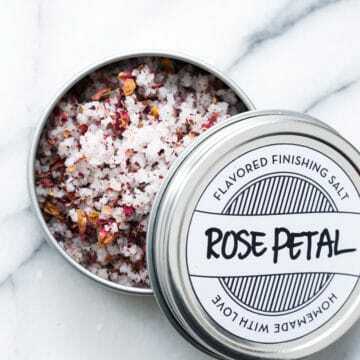 These homemade finishing salts combine gorgeous flake sea salt with unique additions like blueberry, rose petal, and dried lemon peel, combining the flavor enhancing superpowers of salt with unique flavorings that will truly take your recipe over the top. As for which of the dozens of varieties of salt work best here, I experimented with a few different types including coarse sea salt, unrefined sea salt, and flake sea salt. Ultimately, this unrefined sea salt produced the best results for me, being that it is a fresh salt that still contains a good bit of moisture. This moisture allowed the salt to keep it’s coarse flakes even after grinding together with the dried flavoring. 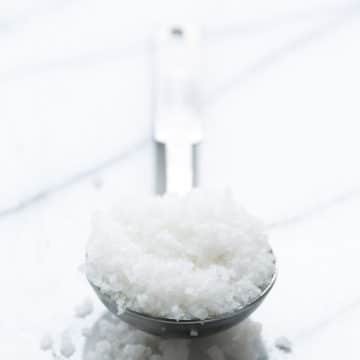 Whereas a plain coarse sea salt, being that it is drier, tended to get pulverized and resulted in an altogether powdery consistency. 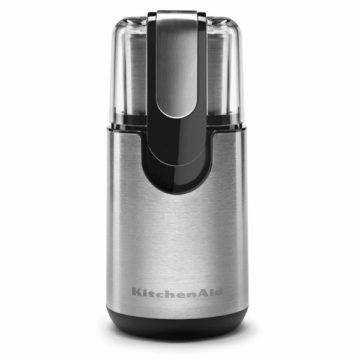 Making the flavored salt is an easy process, simply pulse the dried flavoring in your KitchenAid® blade coffee grinder to break up the large pieces, then add your sea salt and pulse to evenly incorporate. Literally 10 seconds and you’re done. 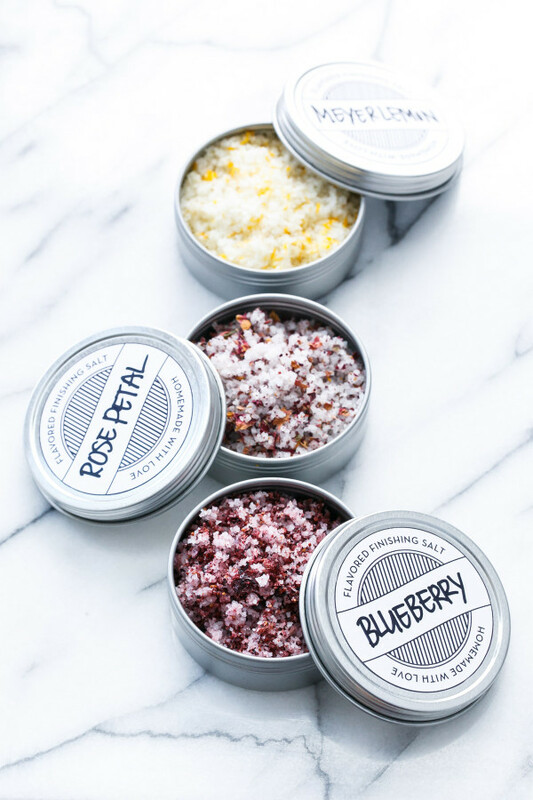 I made three flavors of finishing salt using dried Meyer lemon peel, freeze dried blueberries, and dried rose petals (be sure to buy organic/culinary grade dried flowers). 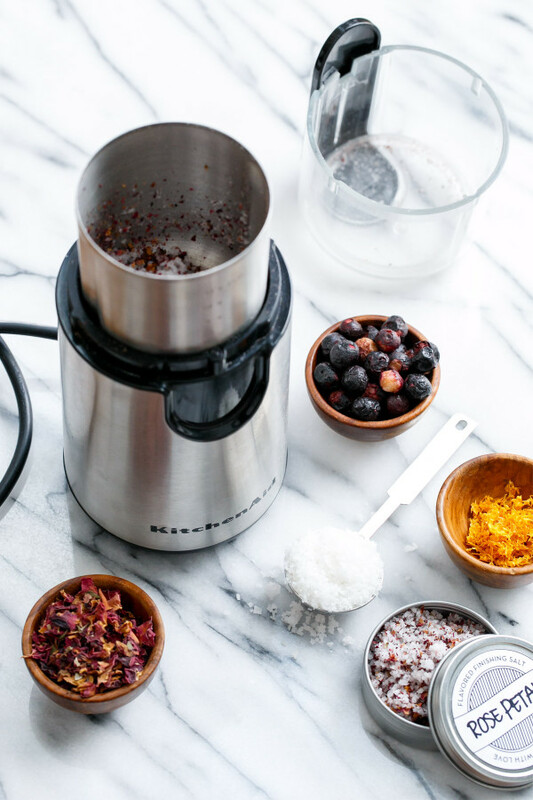 But really, the flavor possibilities are endless… pretty much any dried flavoring that can be ground into smaller pieces will work here. 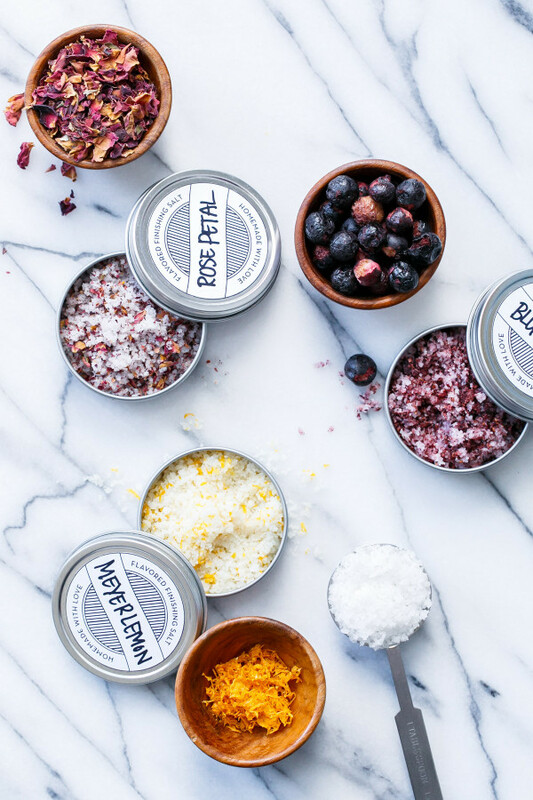 These finishing salts make lovely homemade gifts for any cook or foodie, and perfect packaging will make that gift extra special… and lucky for you I’ve designed some fab labels for you to use on your own creations! Simply print onto sticker paper and fill in the blank with your own creative flavor. The labels are designed to perfectly fit a 2-ounce tin, but can also be used on jar lids or printed on card stock and tied around the neck of a decorative glass jar. 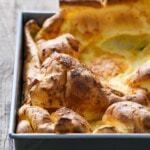 Get the full recipe and instructions (and download the printable labels) on the Kitchenthusiast blog. I made up jars of herbs and flavored salts for family at Christmas. I mixed sel de Camargue with dried herbs from the garden. Another popular mix is with freshly ground black pepper–something we had served on foie gras in a restaurant and easy to replicate. These sound amazing and I love those labels! 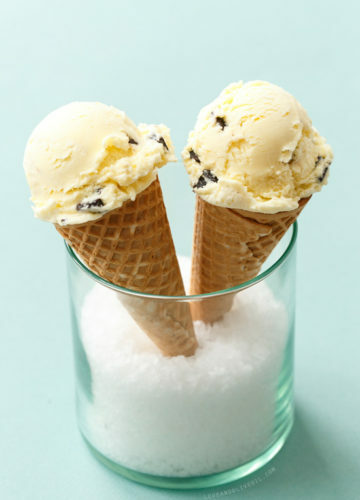 I’ve only made vanilla salt and now I’m inspired to try more flavors. 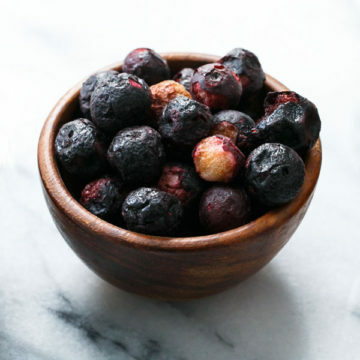 What kinds of things would you use the blueberry salt on? But I also think it’d be great on a salad or steak or even sprinkled on some cookies or ice cream! I think lemon-lime salt would be fab! Oh these are just gorgeous! Where do you get your little tins? Ooh, I love edible gifts! Especially HOMEMADE edible gifts. These sound so good! We are starting to make artisan salts in our shop and I was wondering if you had any issues with the salt fusing with the tin? We originally thought about the tins because we love the look, but once we had a tin and the humidity in the air made it fuse. Just wondering if you had any similar experience. 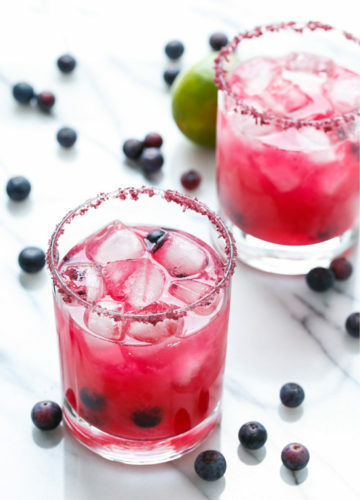 The blueberry salt is such a great idea! We are going to try some interesting fruit salts I think!